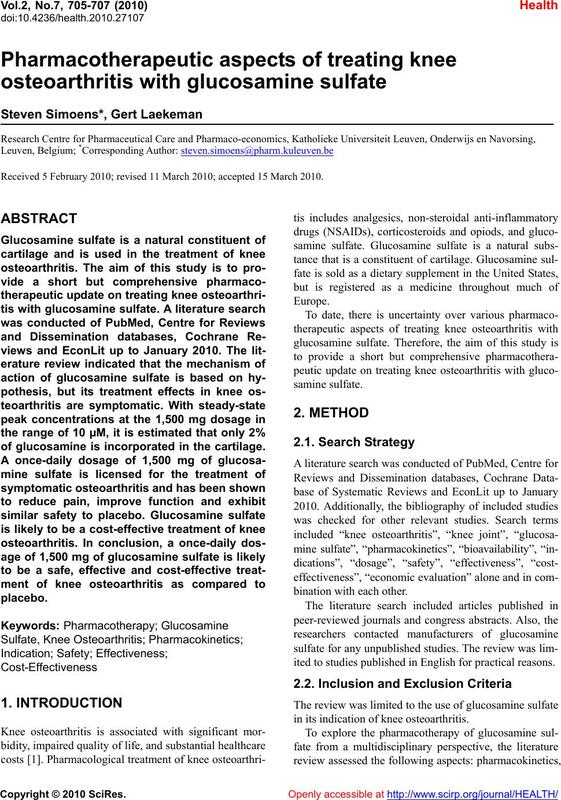 Received 5 February 2010; revised 11 March 2010; accepted 15 March 2010.
of glucosamine is incorporated in the cartilage. bination wi t h each ot her. ited to studies published in English for practical reasons. in its indication of knee osteoarthritis. samine sulfate in knee osteoarthritis. 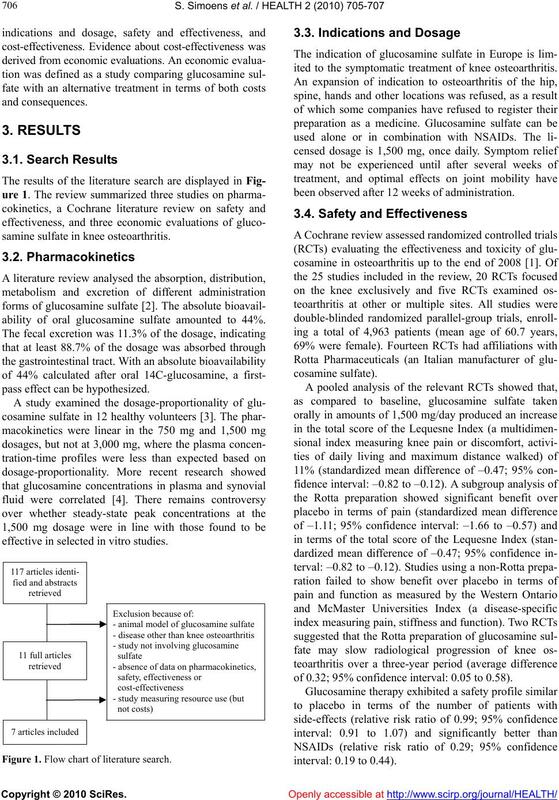 ability of oral glucosamine sulfate amounted to 44%. pass effect can be hypothe sized. effective in selected in vitro studies. Figure 1. Flow chart of literature search. ited to the symptomatic treatment of knee osteoarthritis. been observed aft e r 12 wee ks of administrat ion . of 0.32; 95% confiden ce interval: 0.05 to 0.58). samine sulfate would even be more favourable. ing published effectiveness data and US fee schedules. treating knee osteoarthritis with glucosamine sulfate. treatment effects in knee osteoarthritis are symptomatic. a cost-effective treatment of knee osteoarthritis. conflicts of interest that are relevant to the content of this manuscript. Houpt, J.B., Welch, V., Hochberg, M.C. and Wells, G.A. 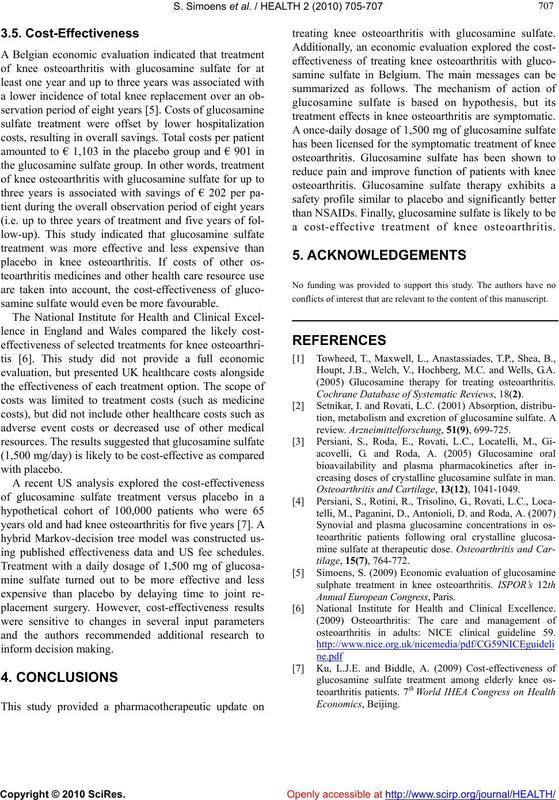 (2005) Glucosamine therapy for treating osteoarthritis. Cochrane Database of Systematic Reviews, 18(2). creasing doses of crystalline glucosamine sulfate in man. Osteoarthritis and Cartilage, 13(12), 1041-1049. Annual Eur opean Congress , Paris. osteoarthritis in adults: NICE clinical guideline 59.